Ssangyong Motor Co., a Korean SUV-focused producer under the family of India’s Mahindra & Mahindra Ltd., is releasing its all-new Korando subcompact crossover in Europe, the company said Thursday. 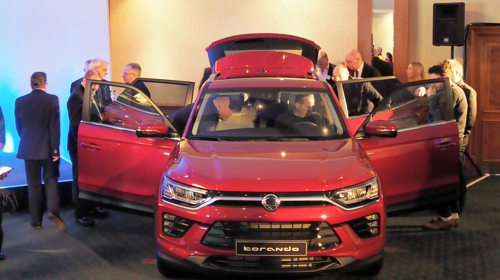 The new Korando SUV was unveiled to 500 local dealers from Germany, Switzerland and other Central European countries at a launch event held on Mar. 28-29 in Antwerpen, Belgium, and then made debut in the UK on Apr. 2. The first global launch was the Geneva Motor Show held on Mar. 3-17 in Geneva, Switzerland. Ssangyong Korando is the carmaker’s flagship SUV model that has been well received both at home and abroad with Tivoli and Rexton Sports. The new Korando with a sophisticated design and advanced technology features is expected to bring more positive response from European customers, said visitors to the launch events. The latest full-change Korando added the high-performance, high-efficiency gasoline model to its trims and is fitted with various safety features and drive assistance technologies. It is go on official sale in the second half of this year in Europe and then expand to other markets in Latin America, the Middle East and Oceania.